I thought that, since my Viking army is already fairly extensive, I’d best find an alternate place for half a box of plastic Dark Age Warriors. 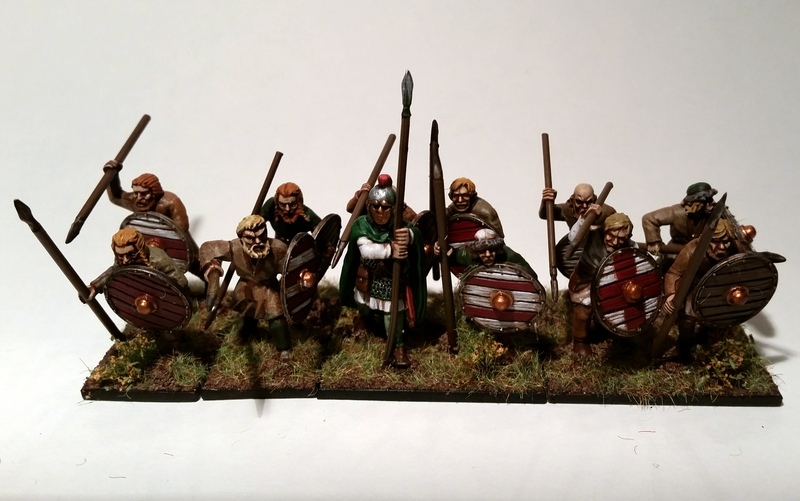 With my Late Romans being in the spotlight, I thought I’d add some barbarians to their ranks. 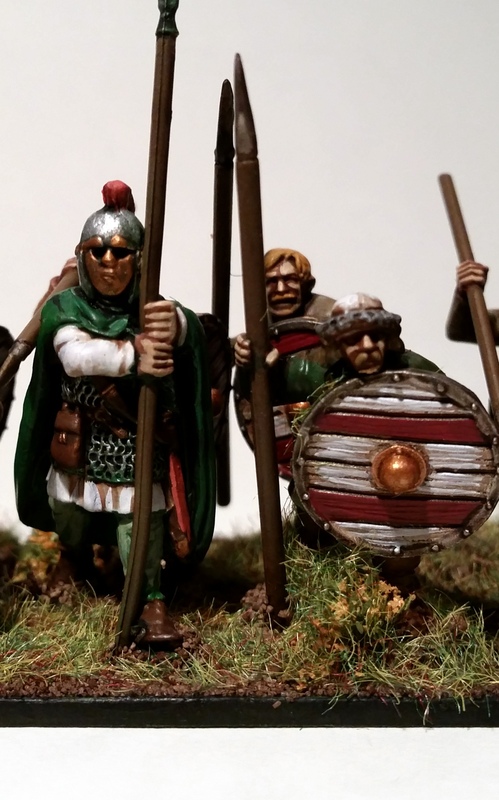 Models by Gripping Beast apart from one Wargames Factory chap, with Old Glory shields. I built most of the models stock from the box, but I opted to use some Old Glory models’ shields which have no leather covers. They simply look more low-tech, especially when compared to those of their overlords’ scuta. Quite a difference between the two. I chose to use a Late Roman to lead the unit. The way I see him, he’s an old veteran, having to lean onto his spear, and perhaps he wears a face plate so as not to show his age to his oft-unruly men. Rather less colourful from the back. Apart from the leader, I painted these models from a mournfang brown basecoat with drybrushes of several brown, ochres and beiges – I really didn’t want them to look uniform. Still, I did add a touch of green and white here and there to tie them in a bit. On the other hand, the shields have the same colours of those of their overlords, but applied in a variety of simple patterns or with no pattern at all. And that’s that, now I’m really laying off the Late Romans for a while. Up next: Dreadball! Second Blog Anniversary part two: Late Roman group shot! Still, it’ll be a nice refight. I don’t have too many models, but I thought I’d show the small contingent I’ll be adding to my clubmates’ Romans next Saturday. The full spread of my small Late Roman army. Click the picture to enlarge it. As you’ll notice I’ve repainted the hats on some of the lighter troops – I mistakenly assumed these were flat helmets instead of felt hats. Thanks to those who were both knowledgeable and bold enough to point this out to me! 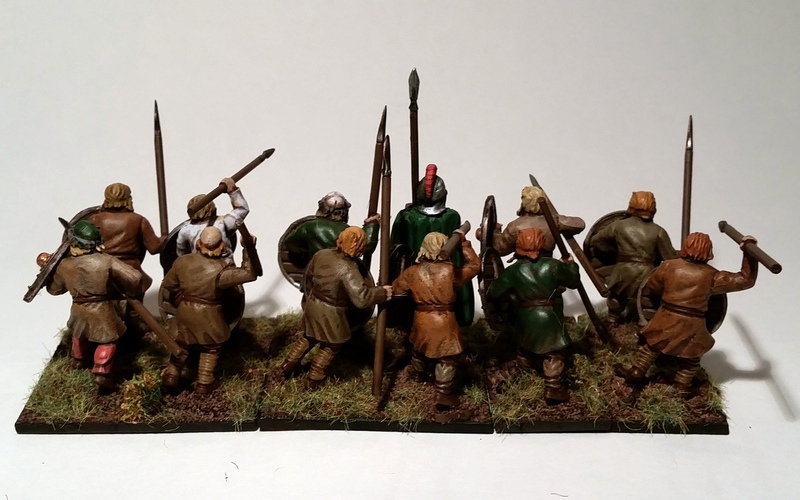 Lovely models by Gripping Beast. 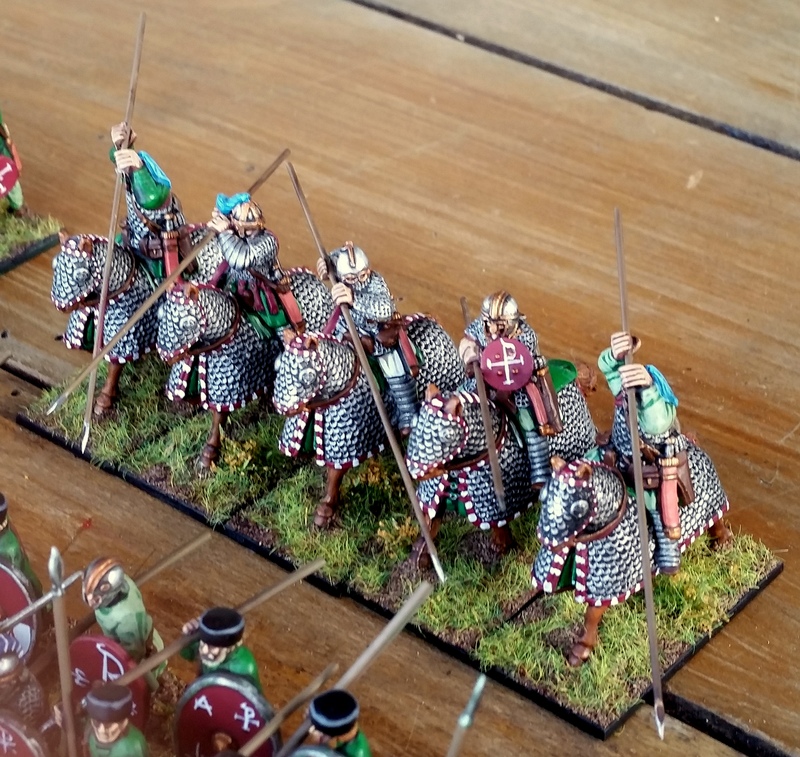 The latest unit off the workbench are these cataphracts. I finally managed to find a unit to try out the AP plate mail metal spray onto, and it did cut some corners. The lining on the horse armour might be a bit over the top, but I really wanted the unit to draw some attention – which they’ll undoubtedly do in our wargames as well! I might add socks to the horses’ feet, but otherwise I’m satisfied with them for now. That’s that then, two years on the blog! I’ll be sure to keep the thing going forwards in its third year as well. First up are the final Landwehr, and perhaps some Vikings as well. Exciting times! 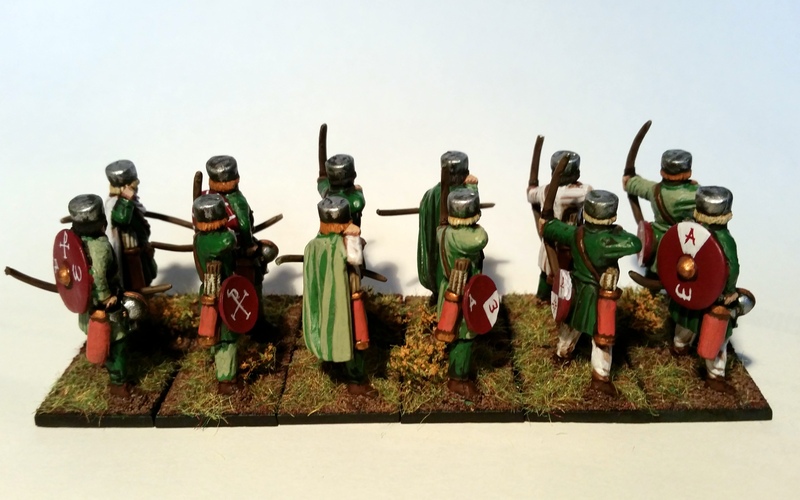 Continuing the Late Antiquity theme of late, here are some archers. Three units plus a commander done now! Paintingwise these are identical to the unarmoured warriors, apart from the fact that their shields are somewhat smaller and have no metal rim, which made painting them a bit easier. I’m not entirely sold on the colour of the quivers. As you will have noticed, I’ve given these models separate 20x20mm bases. This is so I can use them for skirmish games like Saga, but they’ll still rank up nicely for the likes of Hail Caesar and Sword & Spear. So that’s them done. 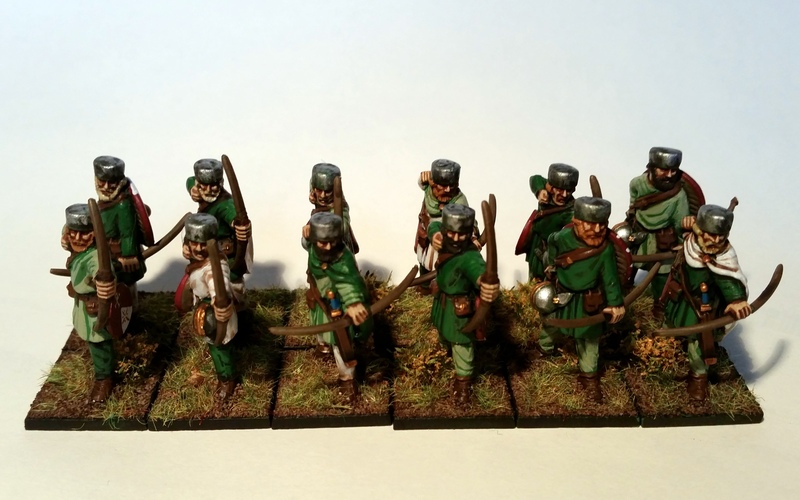 Next up are some Prussians, these should be on the blog in a day or two. Until then!